Over the years, I have suffered occasionally with various degrees of pain in my feet while cycling. Later on during some one day rides, I would get "hot foot" -- if you have had it, you know what it is: the nerves in your foot are telling you the foot is hot, burning hot. Sometimes it would go away by doing one-leg riding exercises and easing the pressure off my left and right feet alternatively. Other times I would need to get off and rest for 5 minutes before continuing. Other times, I suffered the same tingling numbness I remember from lacing ice skates too tightly ... accompanied by searing pain as the blood re-entered the feet once the issue was addressed. Solestar road insole - side view. What is so special? Read on. 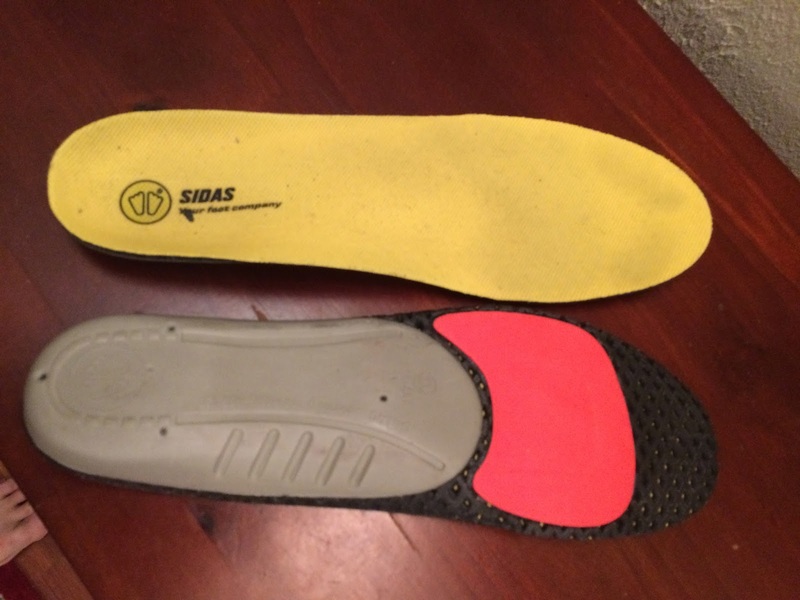 Solestar road insole - top view. 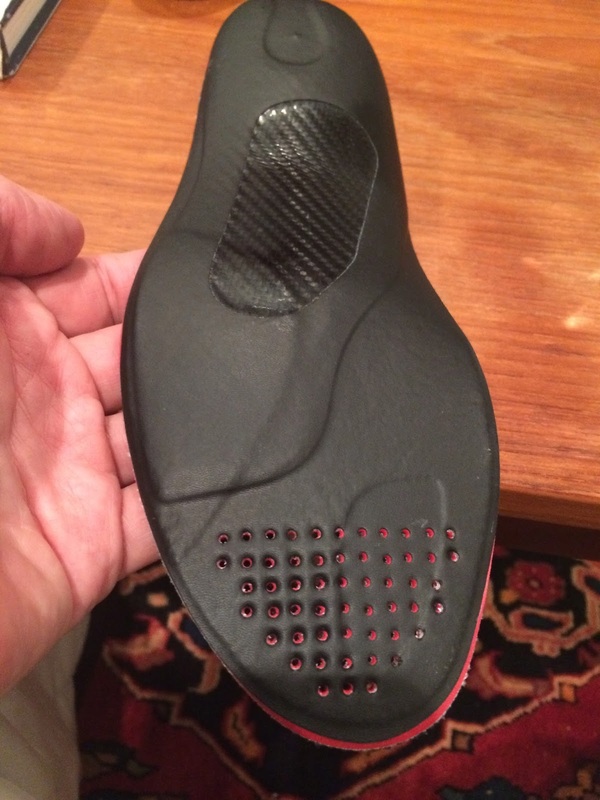 Just another insole? Well, no! 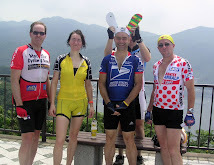 On PBP in 2011, my feet hurt, a lot. I was practically in tears at times. I wore regular road shoes and regular cycling socks. A big mistake for that length of event! So what have I done over the years to manage and even eliminate foot pain? 1. Proper cleat placement. 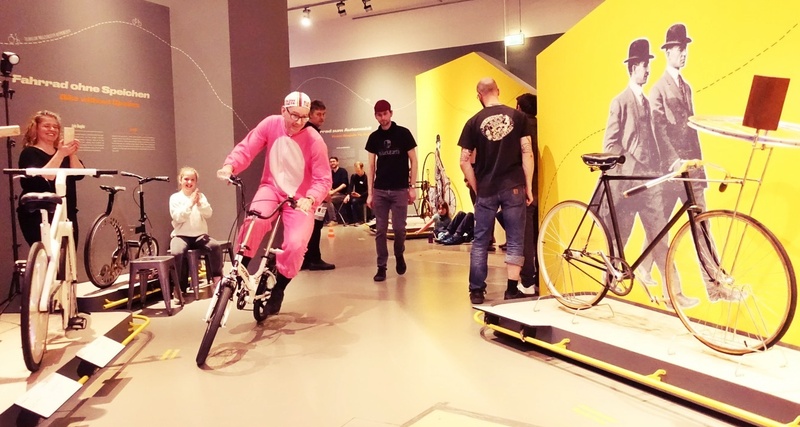 This is the first step -- in my case I need to make sure the cleats are far enough back on my shoes so that I am pushing on the pedals directly with the balls of each foot. 2. Larger but proper fitting shoes. Toes wedged in are not good! 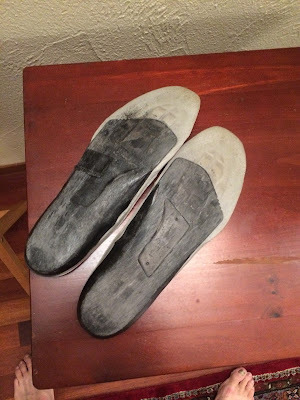 Narrow shoes are not good! Especially on VERY long rides like PBP, it is good to have shoes that give a bit of extra room. I now generally ride one size larger shoes than I did 5 or 10 years ago ... for the same size feet. 3. 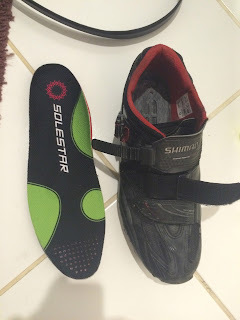 Shimano cycling sandals. I love these for shorter rides, and my feet feel great. But they are too flexy for me to work on rides over 100km. 4. 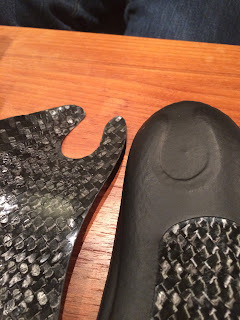 Metatarsal pads. I tried these after reading some about the causes of foot pain ... but I am not convinced they had a significant impact. Some of them were downright uncomfortable. 5. Double and/or thicker socks. Sometimes I avoid thin cycling socks in favor of thicker wool socks, or double socks. This can make a big difference. Recently I would never try a 400km, 600km or longer event riding without double socks -- the inner thin wool and the outer thicker wool. Wool definitely. 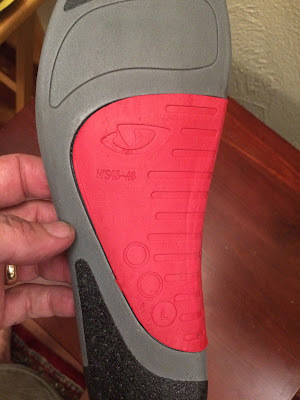 I have never gotten custom orthotic insoles, but I have tried a wide range of aftermarket solutions available in cycling shops and on the Internet, as potential replacements for the insoles that come with my shoes. Sidas insoles -- did nothing for me. 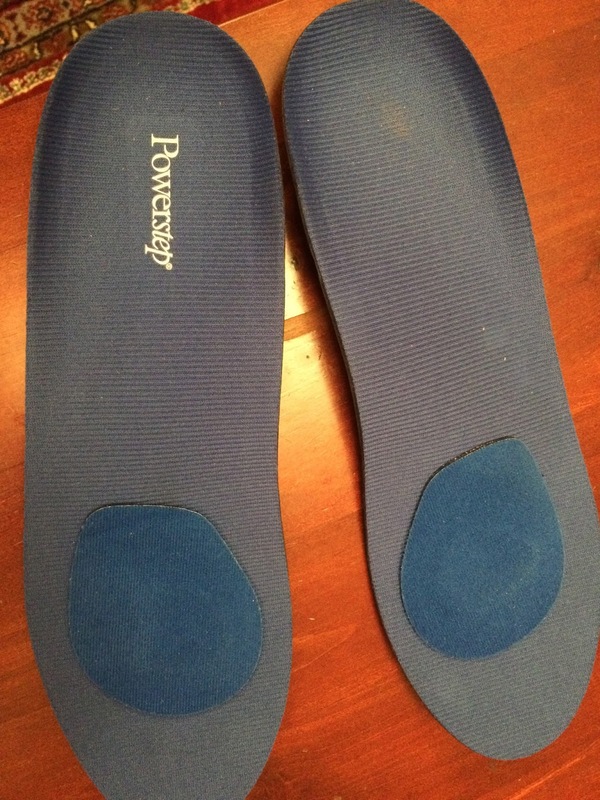 "Powerstep" -- with metatarsal pads glued on -- did not get the job done. 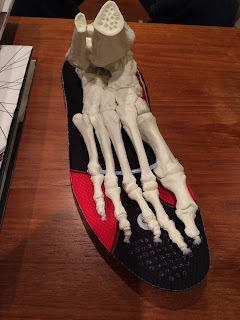 Another common insole with different swapable arch supports for different feet. Nope. Just as I was thinking I really needed a new pair of insoles, my friend David Marx at RGT Enterprises started to import and distribute a brand of insole. Perfect timing! These are called Solestar. Designed in Germany. David swore that I would love them, and that I would notice a real difference if I used them for at least 7-8 rides. I rode in the Dolomites and PBP with the MTB version, and enjoyed almost no foot issues. (Well, there was that one extra long day in the Dolomites when I pushed way too hard for way too long and had a little pain, but otherwise no problems. No foot problems at all on the 1230 kms of Paris-Brest-Paris! Again I am practically in tears ... but tears of joy instead of pain. David warned me that it takes awhile to notice the difference with Solestar. Why? Because they are designed to keep your foot much straighter and more stable in the shoe than otherwise. This helps your pedaling motion and can even sometimes solve knee or ankle issues. It may (according to manufacturer claims) even increase your power. Also, because your legs stay in the correct plane, your stroke is a bit longer than before, and you may even need to adjust your saddle after the first 4-5 rides, raising it a few millimeters. 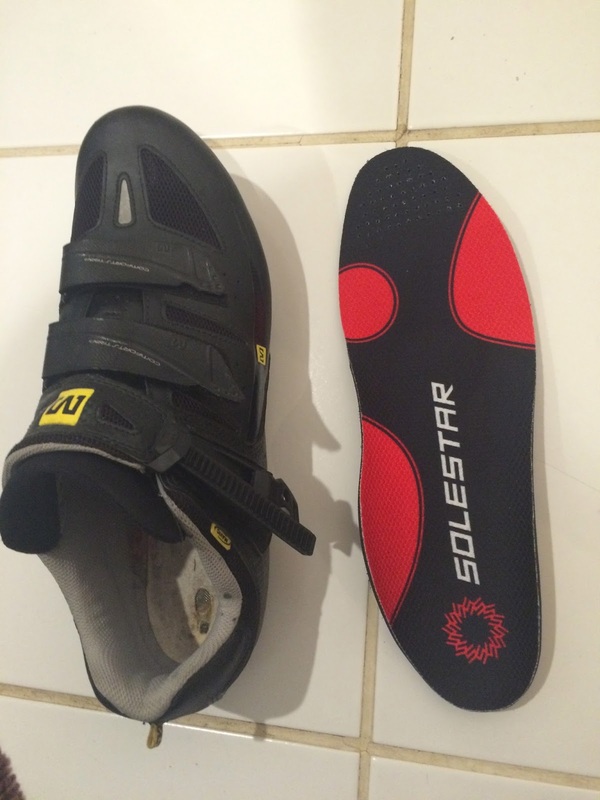 These insoles are very popular with top riders -- Andre Greipel, Fabian Cancellara et al endorse on the Solestar website. Unlike other store bought insoles, they are thick where they need to be, thin where they need to be, they are stiff and flexible just where needed. They hug and stabilize your foot. 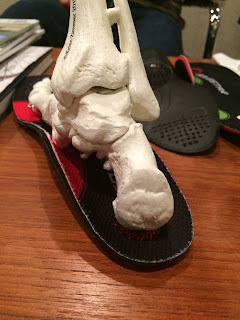 There is even a depression at the rear center so that the large bone at the rear of your foot can sit down and your heel is low enough in the shoe. They are NOT like cheap one-size-fits-all inserts that are cut to fit in your shoe. You must get the right size. The MTB and Road versions retail for 14,000 yen, a fraction of what custom orthotics or high end shoes cost. With an MTB and a Road pair, if I use them exclusively for a few years, I can get that cost down into the ~1 yen per km range. Well worth it for happy feet. This photo STARTS to show the special features. Solestar "black" - sprinter's model. David Marx's model friend "Igor"
I too have had problems with heat spots. Towards the end of Tokyo〜Itoigawa and recently in Fuji Speedway 200 km. It usually comes in the left foot. 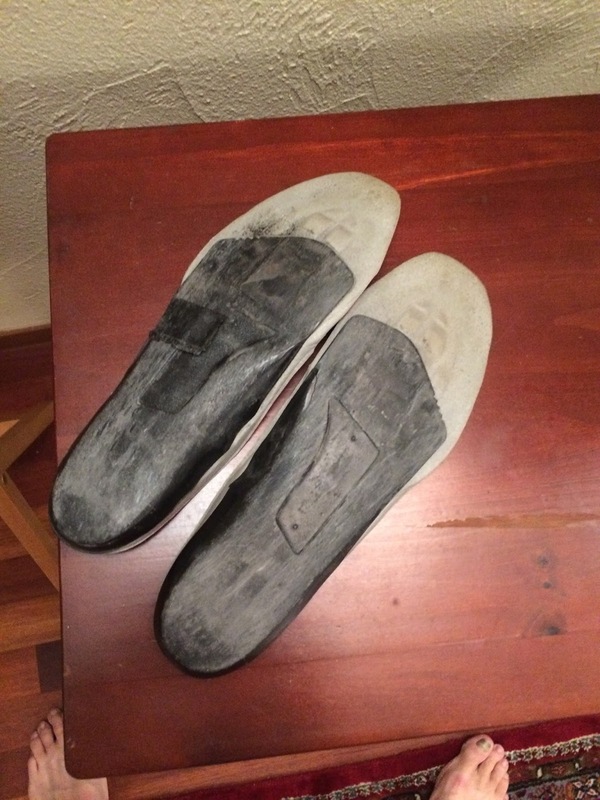 I alleviate it by loosening the shoes on the descents. 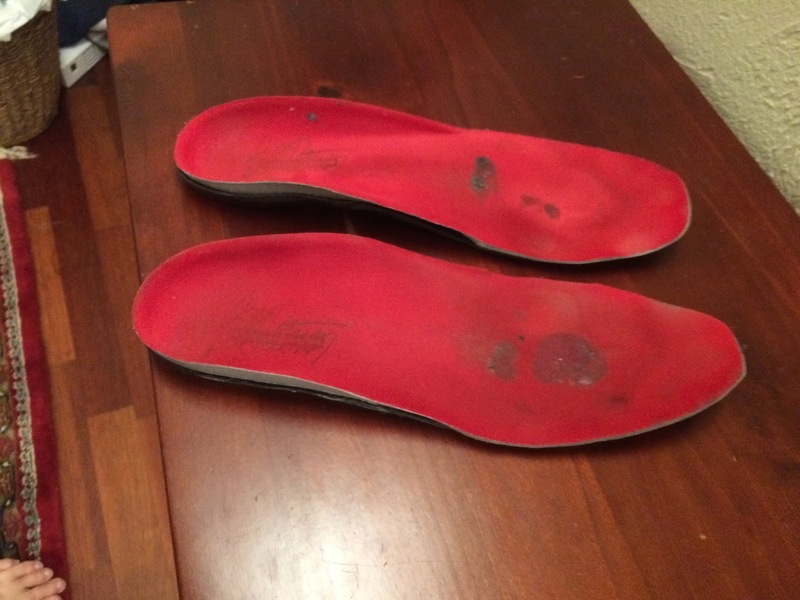 I've been using superfeet insoles for a few years which help. Certainly I don't have problems in training. But it still comes sometimes when going hard in long events.